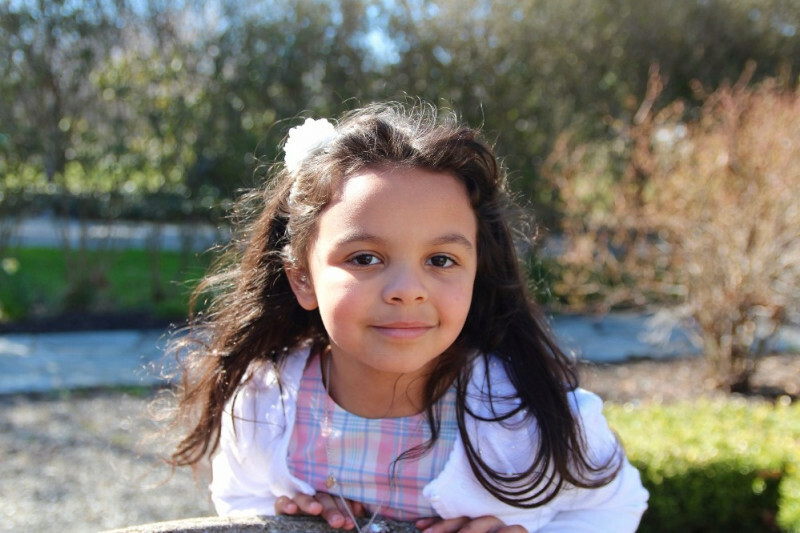 Posted on March 5, 2019 by William A. 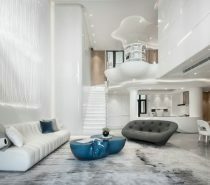 Warm and fuzzy springs to mind when we look inside this home interior, designed by Akhunov Architects. 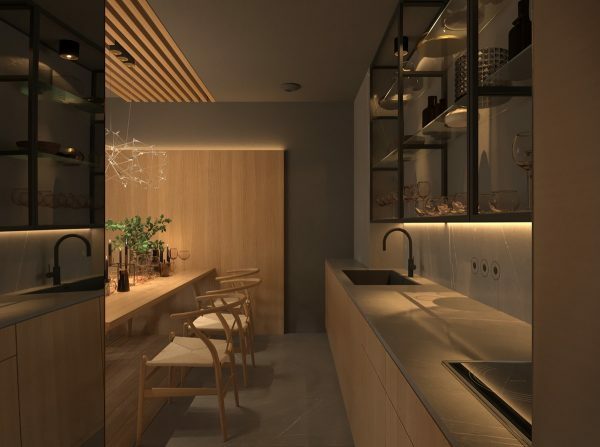 The living space is softly lit with a warm glow that emanates from recessed strips around the edges of the room. Swathes of gentle wood tone on the walls make the interior feel cosier still, and a wood slatted feature stripes the ceiling to match. 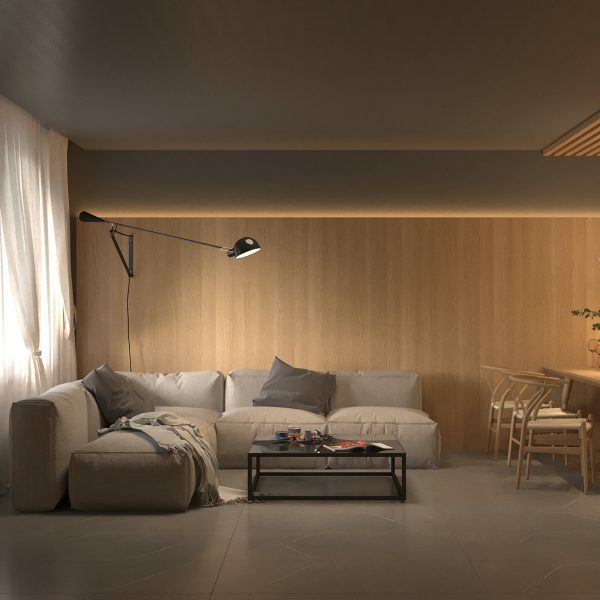 Soft furnishings meld in mellow shades of beige and grey, which match light wood tone and concrete tile in the room. 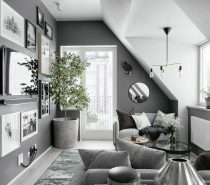 A few black base notes help to anchor the light decor scheme, but it is the snug haze from the perimeter lights that most effectively colours the space and sets the relaxed, intimate mood. 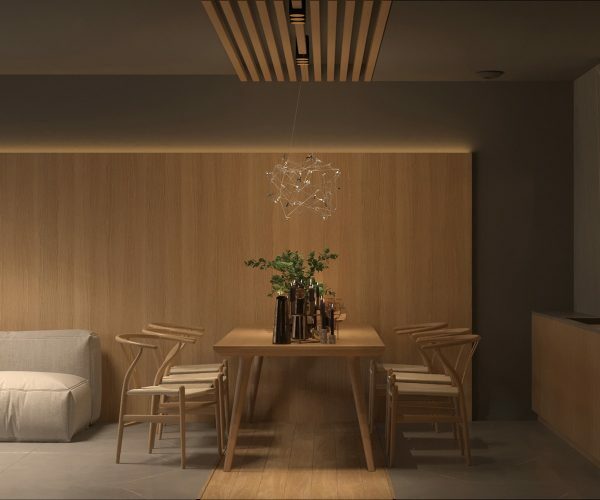 The glow of warm white LED perimeter lights washes down over a full wall of wood panelling in the small open plan lounge. 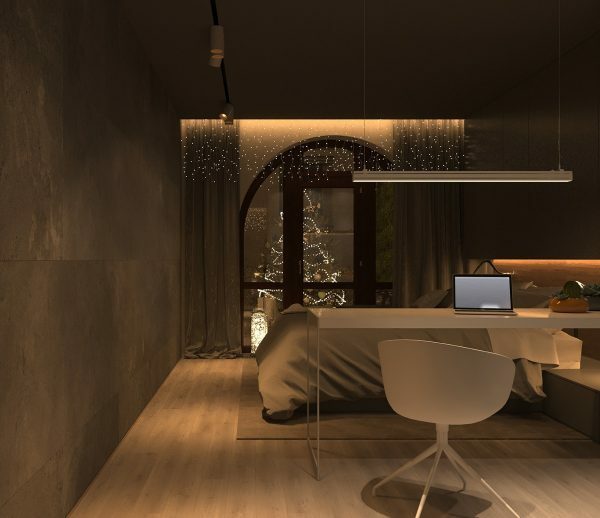 The emanating haze seems to add a cosy yellowish tint to every element in the room. 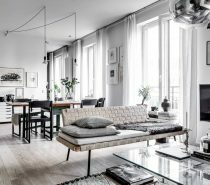 The black swing arm wall lamp that sheds brighter task lighting over the sofa is the Flos Mod 265 style lamp. Original is available here. 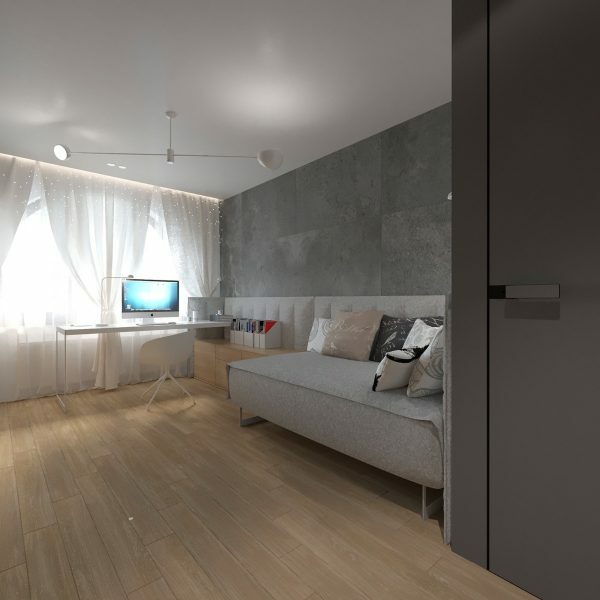 The room is coloured by textured concrete wall tiles, solid grey paintwork that extends across the ceiling and meets with smooth wood tone features and furniture. Soft furnishings are coloured to perfectly match the backdrop. 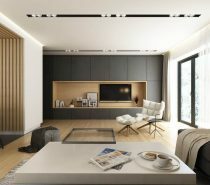 A black coffee table brings a weighty note to the living room, which balances out the black tv screen on the wall. 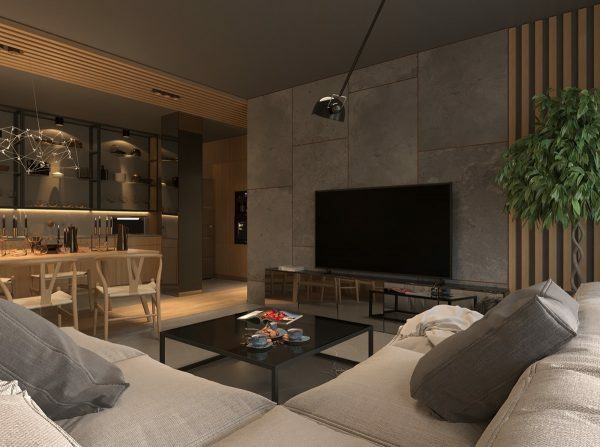 A mirrored media cabinet reflects the room. A wood slatted feature crosses the ceiling above the dining area, which stands adjacent to the lounge. A wood dining table is accompanied by a Scandinavian style chair set of six. A series of candles holders and modern pitchers adorn the tabletop. A modern chandelier hangs down from the slatted ceiling stripe, with tiny bulbs sparkling on a delicate wire frame. 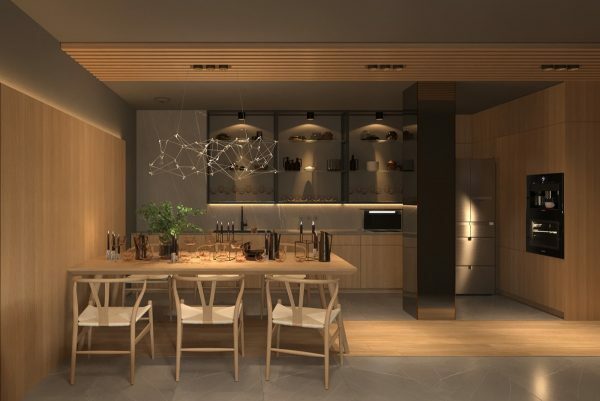 The small kitchen installation is made up of wood effect base units and open fronted wall cabinets, which display glassware and occasional tableware. 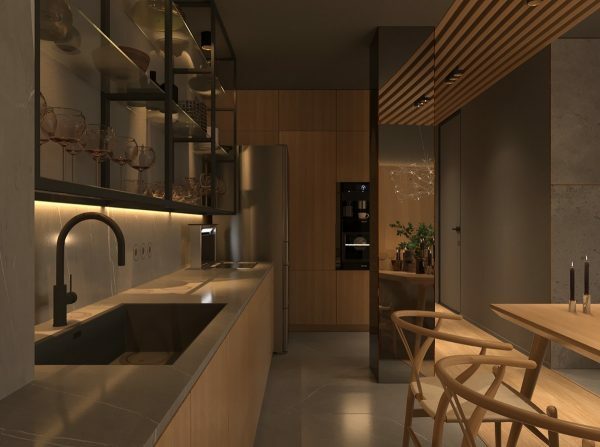 The kitchen arrangement runs around in an L-shape, with the second part made up of full height wood effect units and an integrated coffee maker. 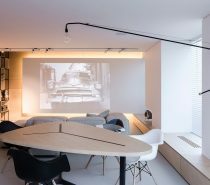 An architectural column has been clad in mirrors around each of its four sides to camouflage it in the room. The mirrored column reflects the slatted ceiling strip, causing an optical illusion that the support column is not there. 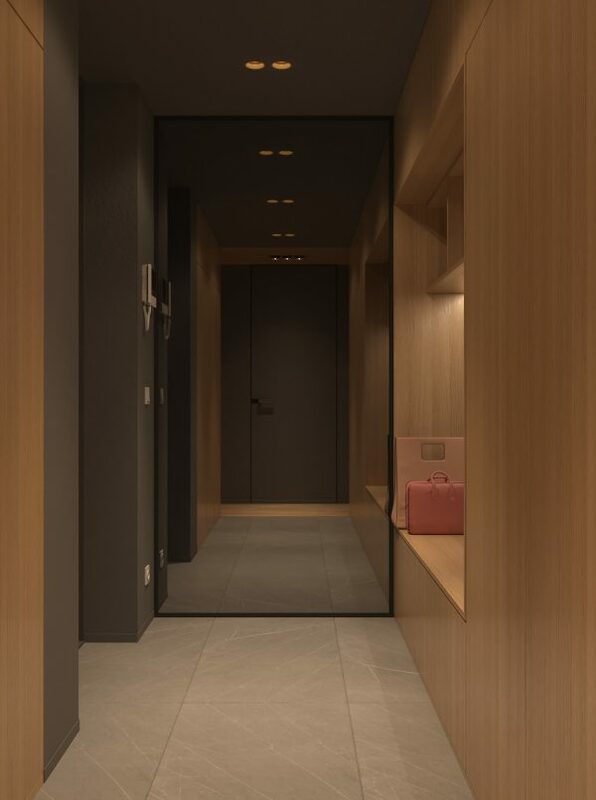 At the end of the kitchen run, a grey hallway leads to the bedrooms. 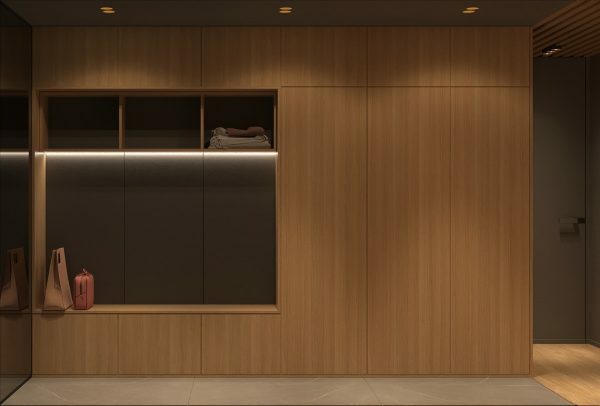 Wood cabinets have been custom built into the hallway to store outdoor coats and surplus items. 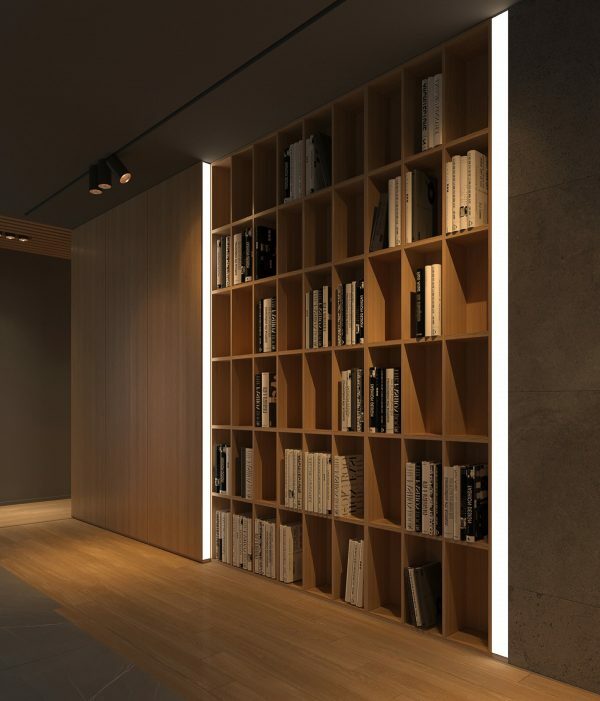 There is also a big bookcase along the hallway, which is lit down its borders by vertical LED strip lights, in order to clearly light up the spines of the books for ease of selection. 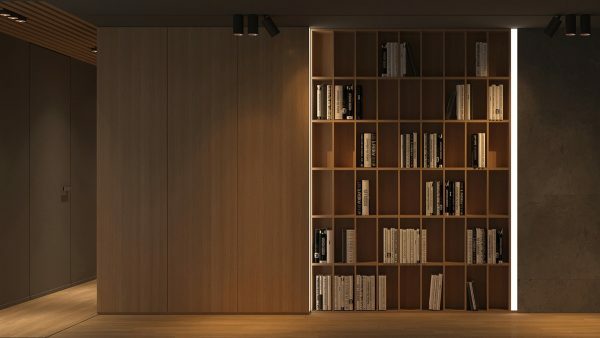 The book storage is divided in to many sections; this keeps the books standing upright without any need for bookends, or repositioning of remaining books after one is taken out. 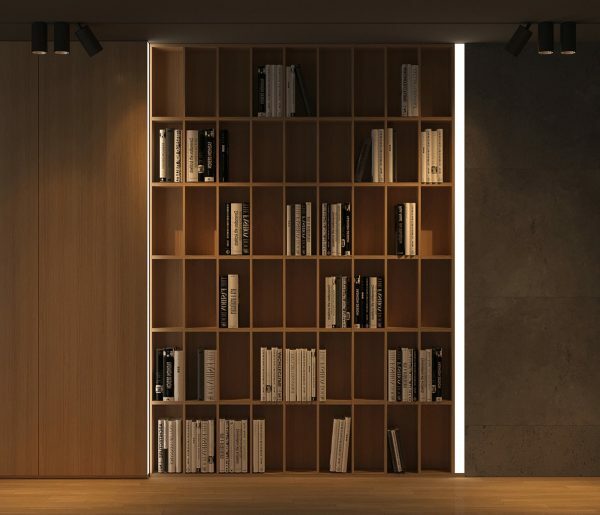 Wooden cabinets end on one side of the bespoke bookcase, and are replaced by textured tile on the other side. 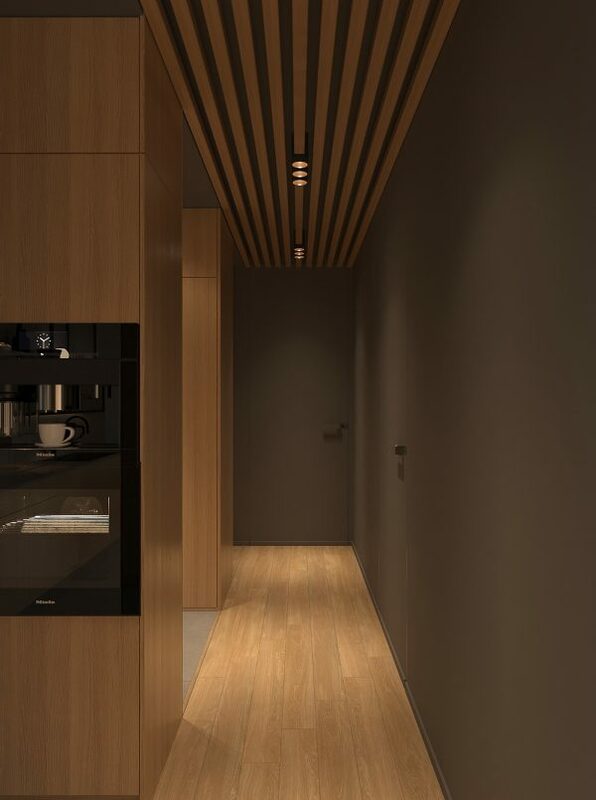 Honey toned timber flooring runs the length of the hallway. 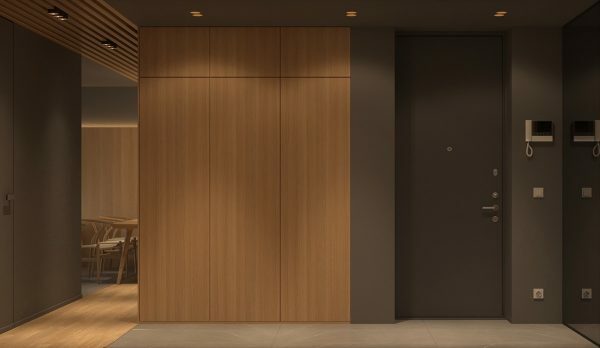 A small nook has been created within the run of wood grain storage cupboards by the entry door. The nook makes a perfect seat when putting on and taking off shoes, or for placing town large shopping bags and totes. 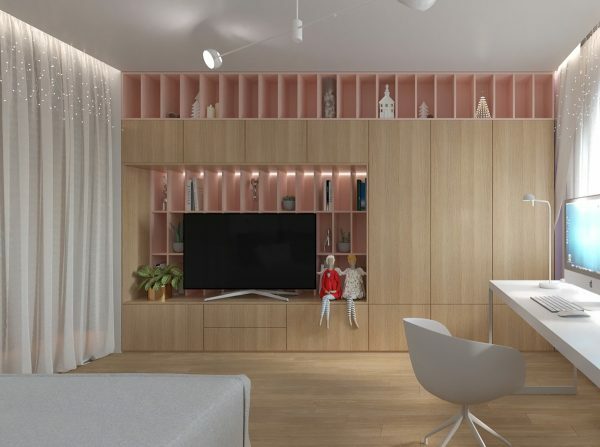 A row of open shelves above the nook can be used to keep a number of items easily accessible. A strip of white LEDS illuminate the area. 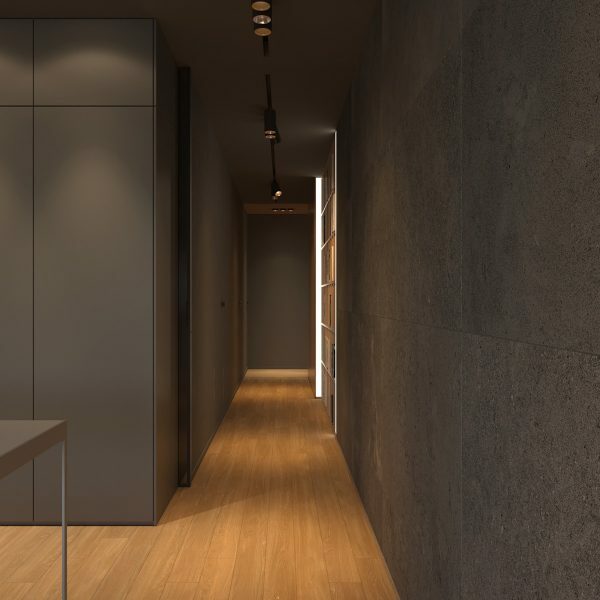 A custom cut mirror fills the full height and width of wall at the end of the hall. 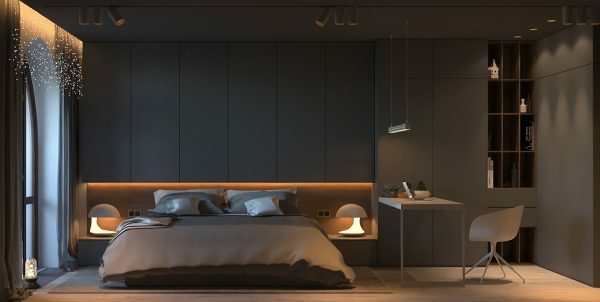 Dark grey bedroom decor has the same cosy glow as the living room. A pair of bedside table lamps nestle in the cosy glow of a headboard recess. 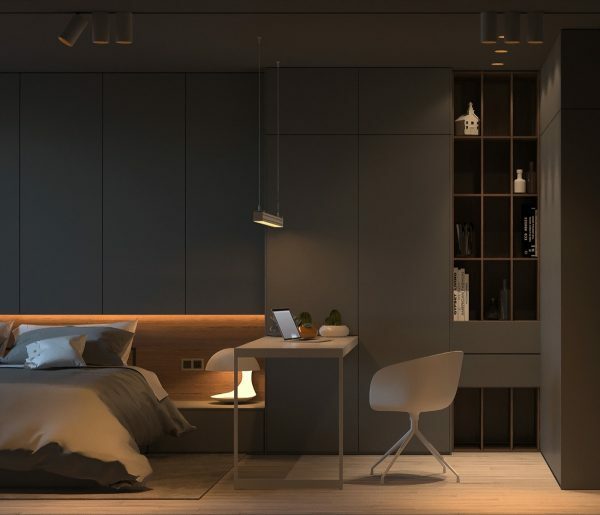 A desk extends from storage cabinets by the bed. The modern desk chair is the About A Chair(Swivel). 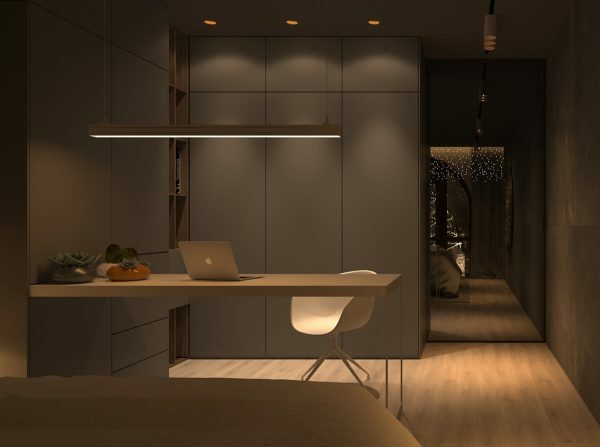 A linear suspension lamp provides bright and focused task lighting along the length of the the desk. Bringing the desk out into the centre of the room like this means that the home office area can take in the view too. 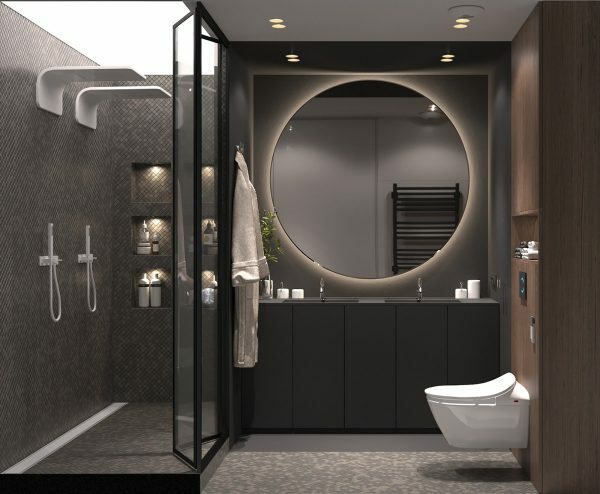 A grey bathroom scheme with dark wood tone and white elements has a sophisticated look. 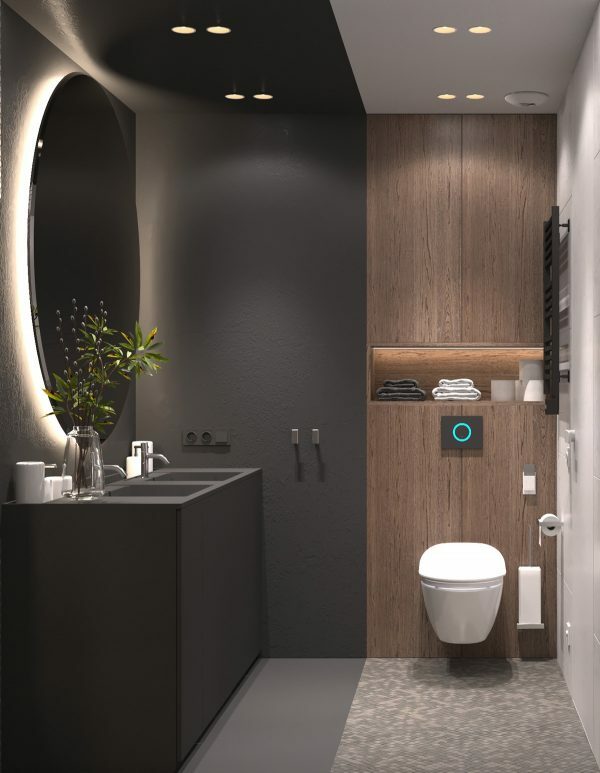 A round vanity mirror casts a glow over a dark grey wall. 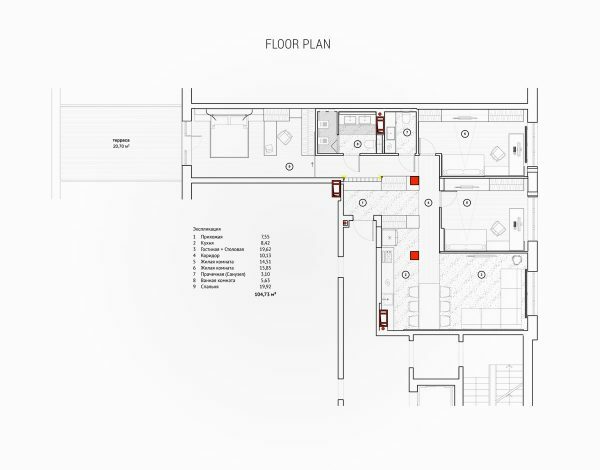 Recessed spotlights illuminate the centre of the room. The double sink bathroom vanity unit has a drop shelf running along the back of it in which to tuck toiletries. 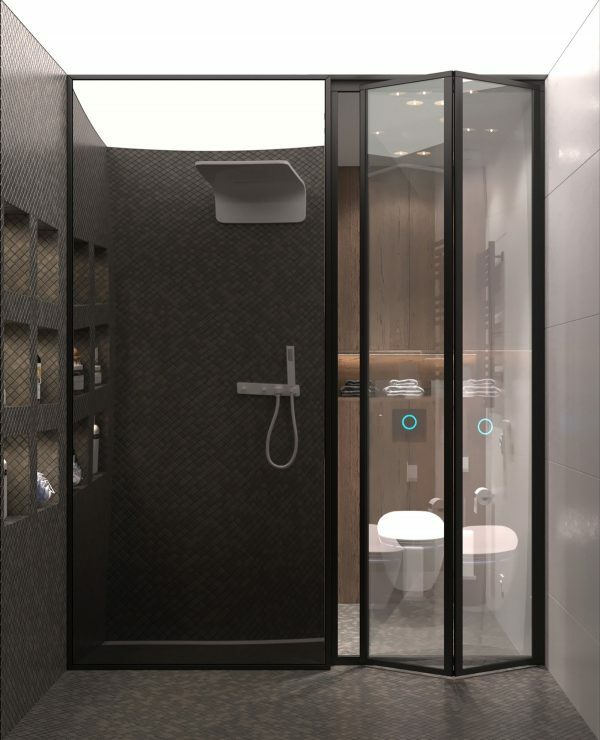 Bifold doors give access to the shower enclosure. A daylight feature blasts the inside of the shower enclosure with crisp illumination. In this image, a full length mirror inside the cubicle reflects one of the two modern shower heads and one handheld rinser. 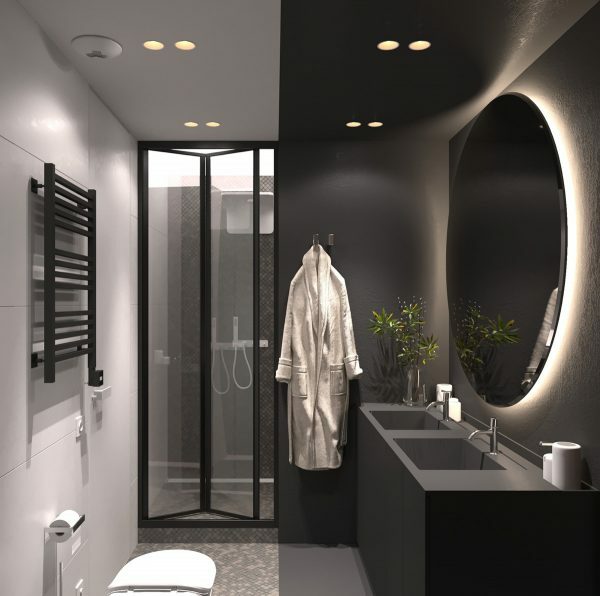 Colour splits the modern bathroom into two sections: completely grey walls, floor and ceiling define the vanity area, whereas the part of the room that holds the toilet is white and wood tone, plus a lightly patterned floor. 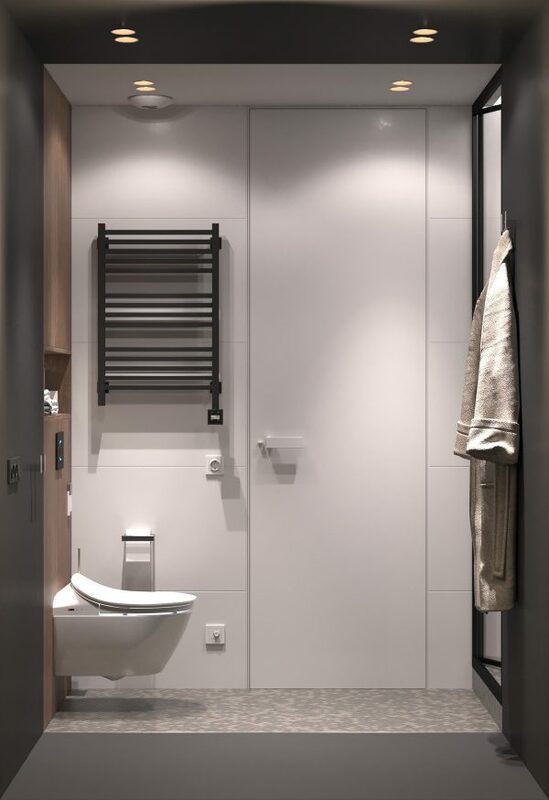 A heated black towel rail is mounted on a plain white panelled wall. The second bedroom is a much lighter affair, and contains a kid’s study. A white desk and chair stand by the window, which is the About A Chair(Swivel). 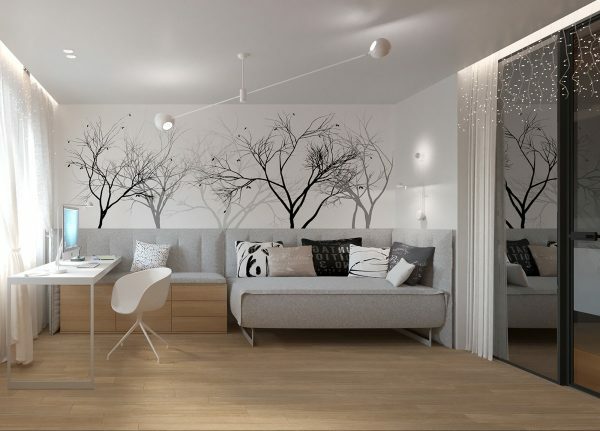 Tree themed decor paints a feature wall. A small modern wall sconce lights the daybed. 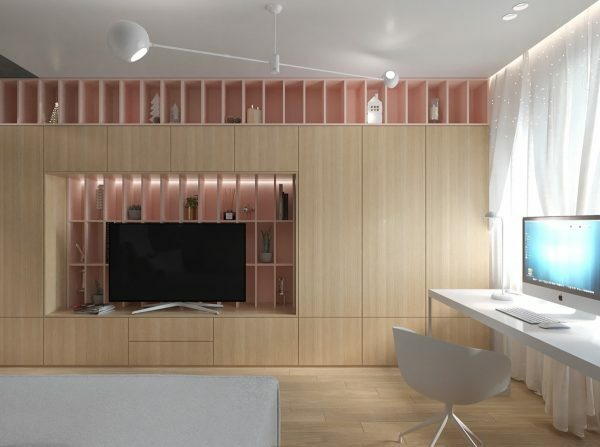 Pink shelves colour the tv wall decor. 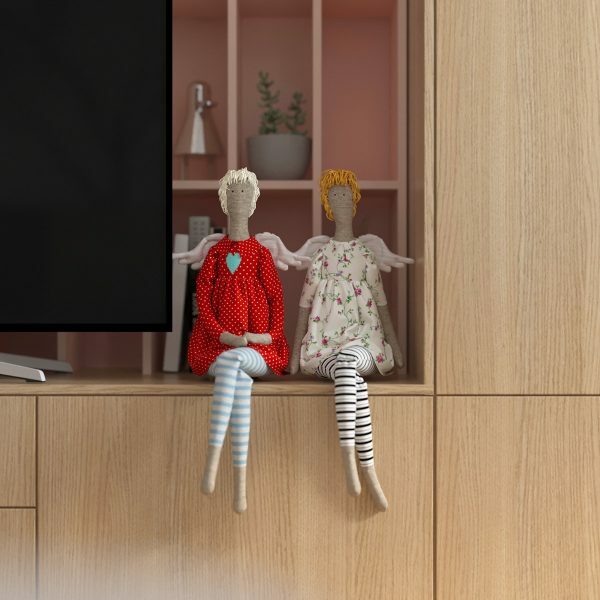 Angel figurines hang out to watch tv. 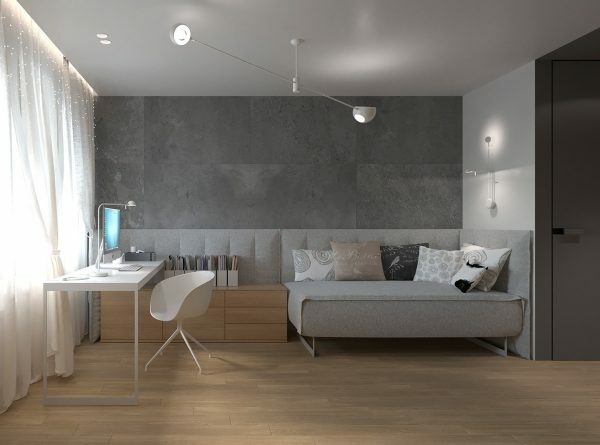 Another kids bedroom design contains the same daybed and desk design, but this time the decor has a solid grey theme. Sheer white curtains let the daylight shine through. 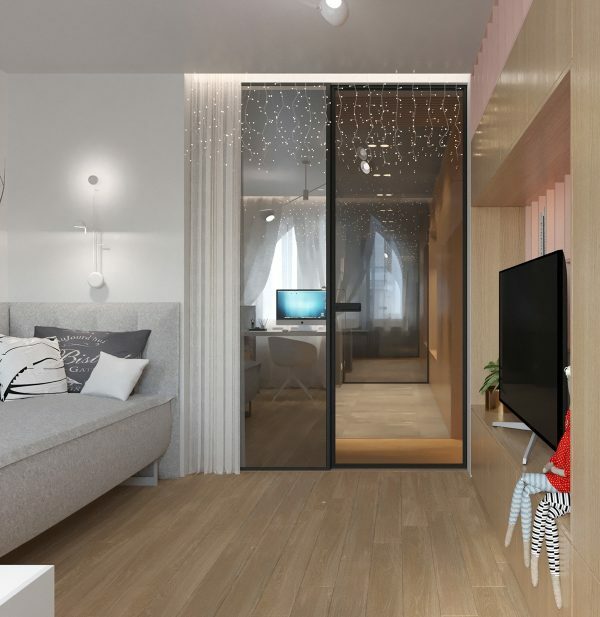 A large mirror reflects the natural light and makes the room look more spacious. Shelving cubbies back the tv nook. 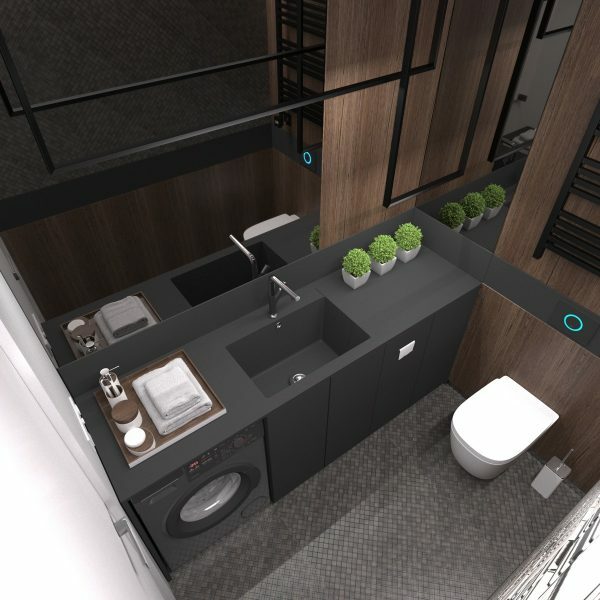 A small laundry room includes another toilet in the home. 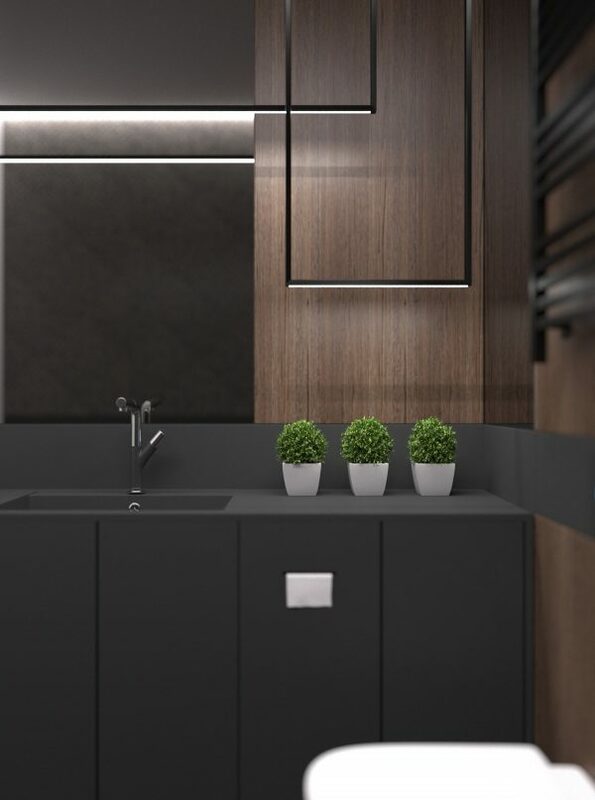 Three pot plants dress the countertop. See more unique planters.